Justin Time Essentials Collection and Nettwerk Records celebrate Record Store Day April 21st with the limited edition, exclusive vinyl-only release of Live At Sir George Williams University by the “Mayor of MacDougal Street” Dave Van Ronk. 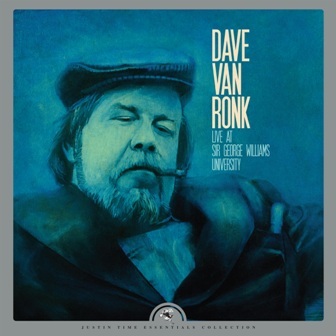 Dave Van Ronk, along with friends Bob Dylan and Joni Mitchell, was instrumental in leading the American folk music revival out from Greenwich Village in the 1960’s. Van Ronk’s was known as the patriarch of the Greenwich Village folk scene but spent much of his career performing solo with a repertory that went beyond folk to include the blues, gospel, rock, New Orleans jazz, and swing. Van Ronk had recorded albums with jug bands, rock bands and on his last album Sweet and Lowdown, sang standards with a jazz group. In December of 1997, Van Ronk received a Lifetime Achievement Award from the American Society of Composers, Authors, and Publishers (ASCAP). His posthumous memoir, The Mayor of MacDougal Street, inspired the Coen Brother’s cult classic Inside Llewyn Davis, starring Oscar Isaac.